Thus speaks the Oxford English Dic­tionary. For the lit­er­arily inclined, the online OED is a treasure trove of ety­mology and usage, and today’s tech-savvy logophiles can thank John Simpson, the influ­ential dictionary’s editor-in-chief for almost 40 years, for this dig­i­tized treasure trove of ety­mology and usage. In “The Word Detective: Searching for the Meaning of it All in the Oxford English Dic­tionary,” pub­lished Oct. 25, 2016, by Basic Books, Simpson recounts his life’s work: dusting off the old OED and show­casing the world’s most com­pre­hensive, reliable dic­tionary on the Internet. “The Word Detective” is an OED entry writ long, a deluge of delightful detail about a database that has become a lifeline for under­graduate English essays and serious lin­guistic schol­arship the world over. It’s a history of the OED, a history of the English lan­guage, and (perhaps sec­on­darily), a history of the editor himself. And for both lan­guage lovers and lan­guage ana­lysts, the book will be “enlight­ening” (n. the imparting of knowledge or increasing of under­standing and insight). 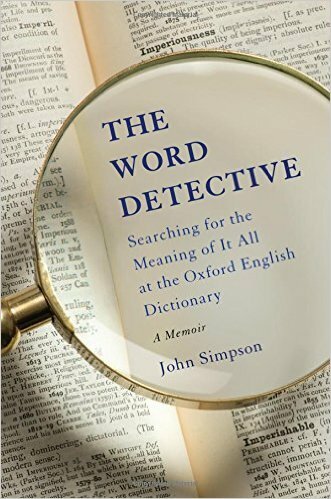 As befitting a memoir about a dic­tionary, Simpson weaves “The Word Detective” together with extended OED-style entries of intriguing words; he began his work with the dic­tionary as an “apprentice” (n. A learner of a craft, first ref­er­enced in 1362 in the poem “Piers Plowman”) in 1976 after studying medieval English lit­er­ature at York College in England. In 1976, when Simpson stumbled upon the OED, def­i­n­i­tions were still cobbled together by expert word­smiths wan­dering through miles of hand­written index cards, as they had been since the dictionary’s first edition in 1857. The OED has always been “crowd­sourced” (from n. The practice of obtaining infor­mation or ser­vices by solic­iting input from a large number of people). Readers sent in note­cards of new and unusual word uses from their casual reading. According to Simpson’s charmed account, images of elderly English ladies filling long after­noons sipping tea in the parlor while doing the Lord’s work for the OED are not far from the old-fash­ioned reality. Yet from these seem­ingly random scraps, lex­i­cog­ra­phers (n. A writer or com­piler of a dic­tionary) scrabbled together one of the most com­pre­hensive running accounts of a lan­guage ever con­ducted. The mission of the OED had always been ambi­tious: “It would provide a potted biog­raphy of English words, pro­viding accurate def­i­n­i­tions of their meanings, detailed infor­mation on word origins, and — cru­cially — quo­ta­tions showing real, doc­u­mentary examples of any word or meaning from its ear­liest recorded use right up to the present day,” Simpson writes. In keeping with the time-honored tra­dition, Simpson began his work in the lower ranks of the OED by reading dull biogra­phies and obscure sci­en­tific accounts to trace the usages of certain words as far back in time as pos­sible. But as he moved up the ladder to edit a sup­plement of words from the 20th century, Simpson soon decided this method was too old-school to keep up with the new words flashing by outside the ivied walls of Oxford Uni­versity. As an editor, Simpson developed his flair for the con­tem­porary, and a fix­ation on keeping up with the lan­guage as it evolved into fas­ci­nating new usages: “My pref­erence was for less ‘lit­erary’ and more ‘popular’ vocab­ulary — more ‘world’ English,” he writes of his time as an editor for the New Words section of a sup­plement to the OED. The twists and turns of Simpson’s various edi­tor­ships are far less arresting than the labyrinth of words he nav­i­gates on the way to the head of a project to com­pletely overhaul the OED in a Second Edition 150 years in the making. Though the old tea-and-index-card system had the advantage of giving new words time to settle down into the lan­guage, it couldn’t keep up with rapid changes after the explosion of tech-lan­guage fol­lowing the rise of com­puters, a phe­nomenon that fas­ci­nated Simpson — and set him to scheming new word-hunts. There were new terms to define (“LOL” appeared on a message board on May 8, 1989), usage changes to trace (elec­tronic mail becomes e-mail becomes email), and new oppor­tu­nities for the study of lan­guage: Could a com­puter tell lex­i­cog­ra­phers if there were more nouns or adjec­tives in the English lan­guage (today, the ratio is 2 to 1, but that number has fluc­tuated in the past for reasons as yet unex­plored)? Could they track a word’s movement over time and map its movement across oceans? Could they include new def­i­n­i­tions from people and pub­li­ca­tions across the world? They could. After a massive five-year project from 1984 to 1989, Simpson accom­plished what no other editor had ever done: He brought an entire lan­guage onto a disk the size of his palm, and in 1995, out into the infinite space of the Internet. This feat is drama enough — what other editor can say he lit­erally held the English lan­guage in the palm of his hand? But com­pared with the weight of this quiet accom­plishment, his attempts to weave his per­sonal life in this his work seem slight. Though the father who struggled with the silence of a mute, men­tally hand­i­capped daughter is cer­tainly poignant, Simpson’s influence rests on other lives — and words — than his. The English lan­guage is not to be admired; it is to be hunted through labyrinths of novels, aca­demic papers, science text­books, TV shows, coffee shops, and bars. It is to be studied, inter­ro­gated, back­ground-checked, and argued over late into the night. Only with such a broad scope and lin­guistic pre­cision can the OED keep tabs on a lan­guage that changes with each text we send, each headline we read, and each hashtag we retweet. For all that, though, Simpson is a genial, expert (and drily British) guide through the English lan­guage. Though he claims his view shuns romance, no man who spends three pages on the myriad uses of the word “as” (metaphor, com­parison, cau­sation — the pos­si­bil­ities are endless) lacks love for the English lan­guage. For Simpson, though, the OED is pri­marily an impressive work of schol­arship: “Britons … have never been quite sure whether the OED is a work of mon­u­mental schol­arship or simply opens up to the world the British at their most obsessive,” Simpson writes. We can thank Simpson’s obsession — and his edi­torial vision and lexical pre­cision — for the labor of love and excellent schol­arship that is the online OED. And that’s some­thing worth “malle­maroking” about.